Some of you have asked about what’s going on in Italy for this “holiday,” and I’m sorry to report: niente. That means nothing. In some parts of the country, they are starting to get children involved with costumes and whatnot, but no one around here does any such thing. This could be because I don’t have kids yet…because if you think my kids are going to miss out on trick-or-treating, well, you’ve underestimated me and my weakness for candy. Added bonus is that the kids around here most likely won’t have to cover up their awesome costumes with big ole coats like we always had to do where I grew up…. Anyway, back to the business at hand, I’m keeping up the Halloween theme for this week’s What’s Cooking Wednesday and giving you a quick, fun idea for a holiday treat. Why not whip up a batch and then head over to Ghouls Just Wanna Have Fun to celebrate? Also, check out the true ghost stories over at Tui’s True Spooks Blog Carnival. Make sure you turn the light on first though! There’s some creepy stuff in there. Happy Halloween, Michelle. 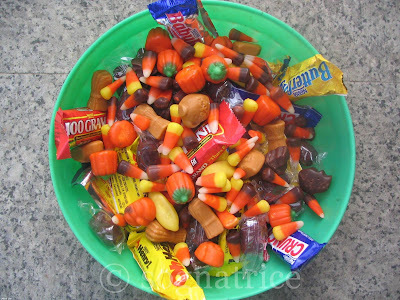 The only halloween candy I bought this year was for you, but I ended up eating it all on the way home. Back to the gym for me!!! Sorry we missed you. Tonite’s my Italian class, so there’ll be no trick-or-treaters for me either!!! R2R, let’s keep our fingers crossed for this connection. Three times it’s gone out for a few seconds/minutes today and every time I’m thinking…Nooooo! Sara, hah! I’m sure you can spare just a handful of candy corn, right? Maybe? Robin, mmm, cider! Yum! I think I’m going to have to figure out how to make my own…. Alexmom, well at least the candy was enjoyed 🙂 I’m sorry we missed each other too (and sorry I missed your call! ), but when bureaucracy calls…. TheOG, I see we have similar candy tastes. For some reason, those two favorites didn’t make it into the last package my mom sent, but she probably thought I still had some from last time she sent them. Hah. Love the little poem! My favorite things about October are the changing leaves and the crisp air…there’s something about the air, the feeling, the smells…it’s like no other. The tomato recipe is great, I wish I would have had it for my party last weekend! And Happy Halloween to you. I am anxious to read your Nov 1 post. October is a wonderful month. It is the absolute best month to say: Ok-toh-ber. Yummy. I am with you on sweaters and soups and fires and yes, stolen Halloween candy (my two boys just get too much of it, I have to help them out, I’m afraid). I ain’t going near the eyeball recipe though, sorry. woo hoo!!!! 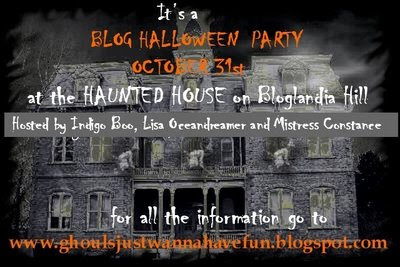 those of us with internet problems are up for hallowe’en!! i love your ghost stories…& i am especially freaked out by the footsteps you heard when your neighbor had died. the coffin would have sent me into spasms! Here I am munching on some tomato eyeballs, staring at the roaring fire, wrapped in my cozy sweater (over my costume, of course!). CHOCOLATE!!!!! I always hated candy corn. First time I took my kids out trick or treating, we came home ,oohhed and ahhhed at the candy and then they pushed it aside and asked for yogurt!!! I could have cried. Qualcosa, believe me, I wasn’t thrilled with the coffin scene either. *So* glad it was light out when I saw it! Karen, sounds like you’re having a lovely evening…and don’t worry, I’ll be happy to eat your candy corn 😉 Your kids wanted yogurt?! Gah! so much good stuff over here!!! I love what you said about October…so perfect!!!! I love that you are in Italy!! My hubby from Montenegro doesn’t get the whole Halloween thing. This year we did it up in style, decorating the house and taking our girl trick or treating and to a party. I love October. It’s my birthday month too. It came and it went, and it was lovely. I hope you had a Happy Halloween! I’ll be looking forward to your posts each day now that NaBloPoMo is here! Cre8tiva, hope you had a great one! Sherry, glad you enjoyed the post, and I hope you had a lovely Halloween! Anali, yes, every day. Each and every day. So long as my internet connection cooperates! I love the eyeballs recipe. PEA, happy to see you! I ran out of time too…I think I’ll be visiting at the Ball for at least another week! Sorry you had nasty weather; we did too, but since we don’t have trick-or-treaters, well, that didn’t matter too much anyway.